This is the first of two Net Zero houses built on spec by Church Community Housing in the market rate portion of a mixed-income, mixed-use, arts and agricultural community called Sandywoods Farm. The development includes 50 Affordable apartments in single family and duplex buildings and 17 unsibsidized market rate lots for sale. The two Net Zero spec houses have been built in the hope that it will stimulate the sale and development of the other lots and that it will set a precedent for energy efficient home construction that will be followed by the purchasers of those lots. Furthermore, the Town of Tiverton where Sandywoods Farm is located has a relatively high property tax rate relative to the surrounding communities. It is hoped that the Net Zero houses would compete favorably with spec houses for sale in those communities by offsetting the higher taxes with low/no utility costs. Lastly, Church Community Housing has long been dedicated to increased energy efficiency, renewable energy development and sustainable and healthy building materials and practices. The construction of these Net Zero houses was simply the next step in a long road of ever increasing residential construction performance. 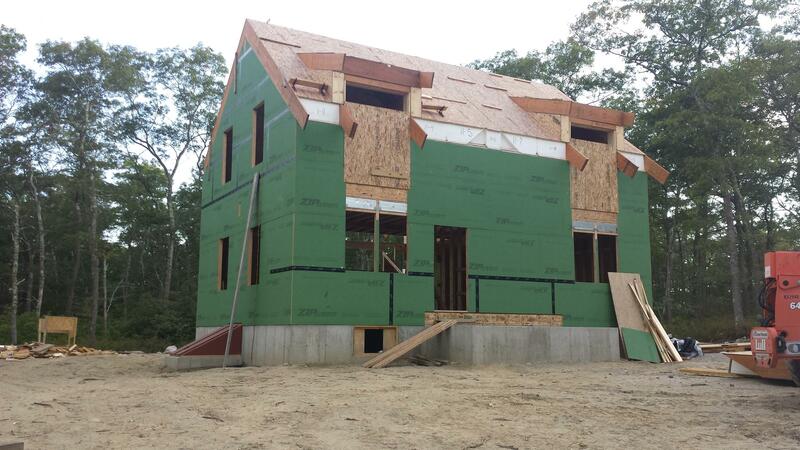 The houses stats are: R-60 SIP Roof, R-50 .8 lb open cell spray foam 12" double stud walls, R-15 closed cell spray foam under the basement slab, R-20 closed cell spray foam on interior of basement walls, R-50 open cell spray foam in rim joist. Triple glazed, low-E, Krypton gas filled windows and sliding glass door achieving .20 or better U-value. Super high efficiency "hyper heat" Fujitsu mini-split HVAC system: one floor mounted 15,000 btu unit on first floor, one compact ducted 12,000 btu unit on 2nd floor. Less than 1 ACH @ 50 Pascals. Panasonic programable bath fans in both bathrooms set to run continuously based on results of blower door test to ensure healthy indoor air quality. Tier II vapor retarder interior primer and gasketed electrical boxes to prevent vapor drive through wall assembly. Electric heat pump hot water tank for domestic hot water. 9kw PV array atop south facing roof. The house will receive a HERS rating upon completion as a result of it's enrollment in the Energy Star Certification program. Initial modeling showed a HERS of 4 - before installation of the larger PV array and higher density spray foam in the walls. The house is expected to achieve a negative HERS rating (net energy exporter) upon completion. R20 closed cell spray foam sprayed on top of 3/4 stone under concrete basement floor slab. 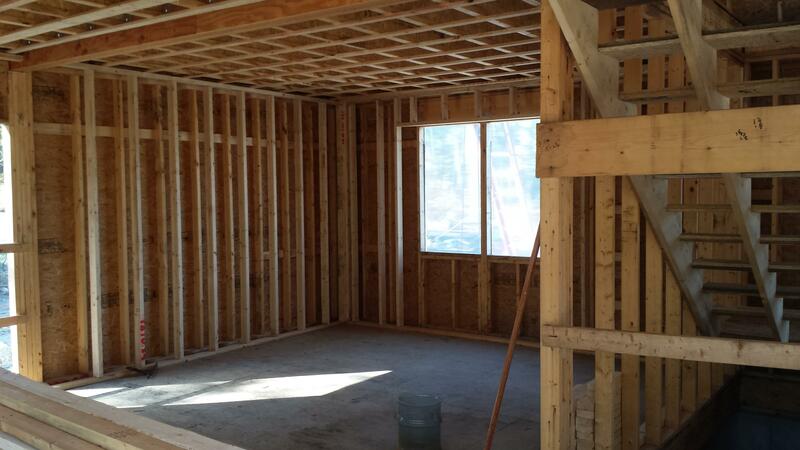 12" double stud walls filled with open cell spray foam insulation. New construction single-family home built "on spec". No buyer in place yet. Renewable Energy System Description & Details: 33 Solpower 275kW photovoltaic panels connected to 33 Enphase microinverters. R-60 SIP Roof, R-40 double stud open cell spray foam walls, R-20 closed cell spray foam under slab and covering entire surface of interior of concrete basement walls. R-40 open cell spray foam in rim joist. Triple glazed R-5 windows and doors. before the slab is poured the closed cell spray foam is sprayed on the stone and up the interior of the foundation walls. Therefore the slab is completely insulated from the outside. blower door testing will be done at end of construction. All ducting is within the conditioned space. House aesthetic and floor plan designed by Northeast Collaborative Architects with input from CCHC regarding function. 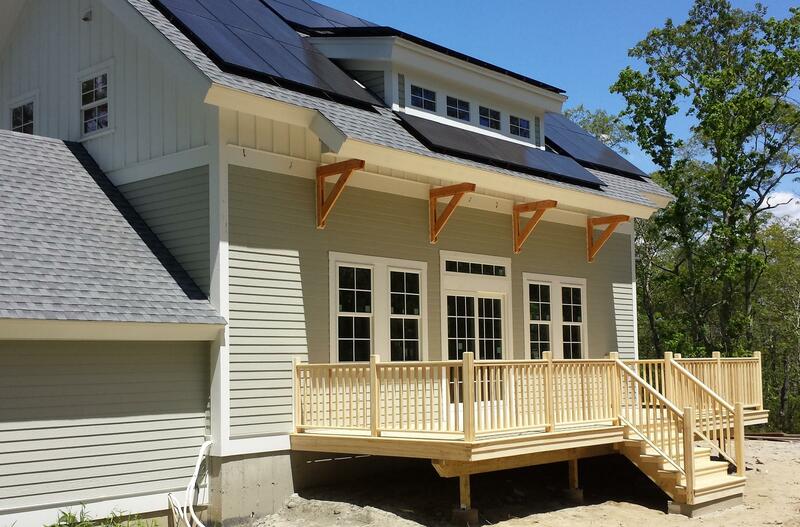 CCHC staff member completes NESEA Net Zero Homes course and applies lessons learned to ensure the house will function as Net Zero. There are 16 remaining house lots to build on. If this design proves popular it can be used over and over again. Also, the most cost effective features of these houses have been incorporated into the design and construction of all other single family homes CCHC develops. So far the result of this is 6 affordable land trust homes being built to zero energy ready and being sold for $150,000. All of these homes will be finished by June of 2016 with Purchase and Sales Agreement in place with buyers for all of these homes. Mark Rosenbaum's software that is provided in the Zero Energy Homes class. Keeping cost of construction to as close to the standard for a conventionally built home built "on spec" wasn't achieved because of the SIP roof which was expensive both in material and labor costs as compared to a truss built roof. This SIP roof was used because the house is not a full 2 stories it is a 1 3/4 story home with dormers and cathedral ceilings. If a full 2 story design had been started with savings would have resulted from the simple roof design, lack of dormers, and ability to use blown in cellulose insulation in the attic. Not yet able to do actual measurements. CommerceRI Renewable Energy Fund $8,649 grant.